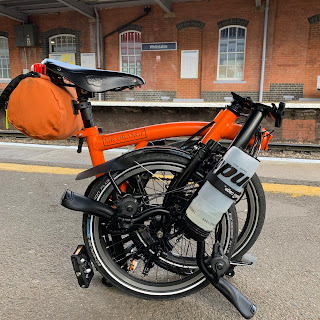 My Orange Brompton: Getting Better Military Style? You will be happy to know that I am gradually getting better. I still walk with a slight limp which has caused some embarrassment. Yesterday some work colleagues took me out for luncheon. Wanting to get back on my feet ASAP I decided to place the food order at the bar. I limped over and placed my order. While doing this an older gentlemen engaged me in conversation. He asked how long it was until I was fully recovered. I said at least another 4-5 weeks. This gentlemen then proceeded to try and buy me a pint. I said thanks and explained that I didn't drink. I thanked him and returned to my colleagues wondering why he wanted to do this? Later one of my colleagues was ordering an extra food and it transpired that the gentlemen had thought that my limp must surely have meant that I had recently come back from Iraq or Afghanistan minus a leg! I mean really. My colleague didn't embarrass the gentleman or me by revealing the truth as I limped out of the establishment.